This is the fifth and final in a series of articles describing corneal opacifications. There are several etiologies for corneal opacifications that do not stain with fluorescein. These include corneal pigmentation, fibrosis, calcium or lipid deposition, cellular infiltration, the presence of a foreign body, sequestrum, and/or edema. This article will concentrate on corneal opacifications arising from corneal cellular infiltration. Corneal infiltrates are single or multiple discrete aggregations of yellow-white, white, or pink inflammatory cells that have invaded into a normally transparent cornea. These cells are accumulations of neutrophils, lymphocytes, macrophages, eosinophils, and/or mast cells. The white blood cells are thought to migrate from the limbal blood vasculature to the cornea via the tear film. Corneal infiltrates can be secondary to corneal infection (Figure 1), or be considered “sterile.” Causes of infectious corneal infiltration include bacteria, viruses, fungi, or protists. In contrast, “sterile” corneal infiltration can arise from trauma (surgical or non-surgical) or be associated with an immune-mediated disease (Figure 2). Corneal infiltrates arising from trauma include granulation tissue associated with indolent (“non-healing”) corneal ulcerations, and sloughing corneal sequestra. 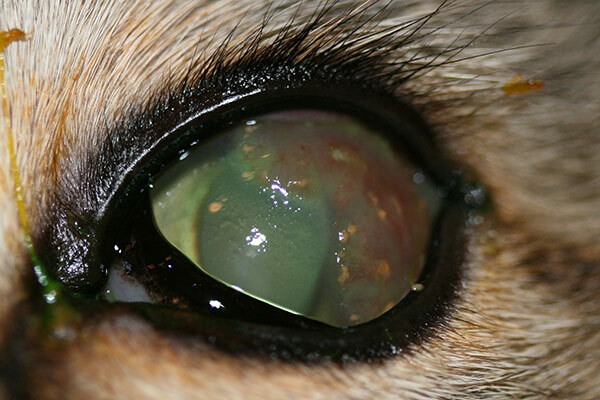 Immune-mediated diseases associated with corneal infiltration include canine chronic superficial keratitis (pannus), canine superficial punctate keratitis, feline eosinophilic keratitis, and feline herpes stromal keratitis. It can be difficult to define the etiology of a corneal infiltration. Topical steroids are often prescribed to simply diminish an infiltration, but this will not prevent an underlying infectious etiology from developing and possibly leading to a loss of vision and/or an eye. Proper diagnoses of corneal infiltrations consider the prior medical history of a lesion, its depth, its ability to stain with fluorescein, and the extent of blood vasculature that surrounds it. The comfort level of a patient can also be diagnostically valuable. In general, infectious corneal ulcerations are painful (with blepharospasm), whereas immune-mediated or granulating lesions are not (as long as the lip of corneal epithelia remains intact). Infectious corneal lesions have limited histories of 24 hours to a single week. In contrast, immune-mediated and granulating lesions tend to be associated with longer histories that last from weeks to months, are typically surrounded by infiltrating blood vessels, and are not associated with a loss of corneal stroma. An infectious corneal ulceration will often present as a rapidly deepening isolated “island” within a cornea. 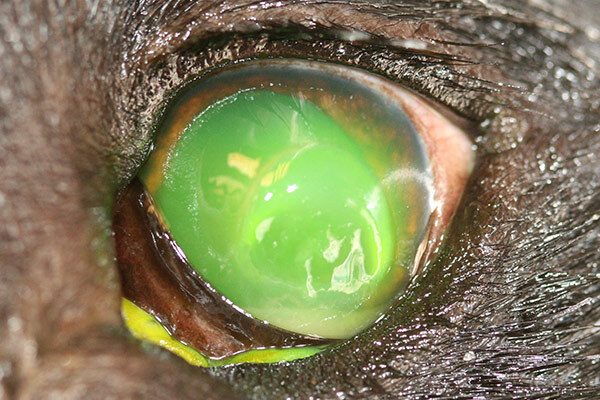 Since corneal stromal abscesses (corneal infections that have epithelized) are rarely observed in both dogs and cats, most corneal infections will also stain with fluorescein. Determining if there is an infectious etiology underlying a corneal infiltration can be difficult. Prompt referral of these cases to a veterinary ophthalmologist can often result in better prognoses. If you have further questions concerning the differential diagnoses of corneal infiltration, please feel free to consult with a veterinary ophthalmologist.